Today is Buddha Purnima or Buddha Jayanthi. Buddha means "enlightened one" - someone who is completely free from all faults and mental obstructions. The word Purnima means a full moon day. This day is a thrice blessed day. Lord Buddha is considered by the Hindus as the ninth avatar (incarnation) of Vishnu (Preserver in the Hindu Holy Trinity of Creator-Preserver-Destroyer). According to Buddhist tradition, Buddha, after his previous incarnation as Santos Kumar, was living in paradise. He was asked by the gods to take rebirth as a human being for the salvation of the world and to show human beings as well as the gods the road to bliss. He considered the gods' request and, on the day of the full moon in Asadh (mid-June-mid-July), he entered his mother's womb through a dream. He was born on the following auspicious Baisakhi purnima. Gautam Buddha or Siddhartha was born in 563 BC to King Suddhodhana, the king of Lumbini in Nepal and his wife Mayadevi. Siddhartha was prophesied by the royal astrologer to become either a famous emperor or a world-renowned ascetic. The father, anxious that his son should not take to the thorny path of a recluse, took extraordinary precautions to avoid every situation which would provoke such thoughts in his son's mind. Siddhartha grew of age without ever knowing what misery or sorrow was. At the age of 16, he married a girl named Yashodhara and after a few years they had a son who was named Rahul. One day the prince desired to see the city. The King ordered that the city should be all gay and grand, so that everywhere his son would meet with only pleasing sights. However, an old and crippled man by the roadside happened to catch Siddhartha's eye. For seven long years, Siddhartha roamed in the jungles, underwent severe austerities and finally, on the Vaishaakha Poornima Day, the supreme light of Realization dawned on him. He thereafter became Buddha, the Enlightened One. When he was an itinerant monk, he was called Gautama and now he became popular as Gautama Buddha. Gautam Buddha was not a god and the philosophy of Buddhism does not entail any theistic world-view. Buddha Gaya where he attained his supreme enlightenment has to this day remained one of the most sanctified places of pilgrimage for the entire Hindu World. Buddha Purnima is celebrated to commemorate the three most important events in the life of Lord Buddha viz., his birth in 623 BC, his enlightenment or attainment of wisdom through meditation in 558 BC and his attainment of Nirvana or freedom from the cycles of life and death at the age of 80 in 483 BC. According to the Buddhism, sorrow and desire are the main cause of all the evil and suffering of this world. The teachings of the Buddha are solely to liberate human beings from the misery and sufferings of life. Lord Buddha advocated the Eightfold Path consisting of precepts like right conduct, right motive, right speech, right effort, right resolve, right livelihood, right attention and right meditation to gain mastery over suffering. It is only after following this path one can reach the ultimate aim of Nirvana. Nirvana is the transcendental state of complete liberation. Lord Buddha travelled far and wide teaching hundreds of followers. Even after death his disciples continued to spread his teachings. The Mauryan Emperor Ashoka espoused the Buddhism in the 3rd century B.C. and helped in spreading it far and wide. As days passed, the effect of Lord Buddha's teachings not only influenced the Hindu people in general but contributed decisively in elevating spiritually several races spreading over a vast region of the globe, including areas such as the present-day Syria, Egypt, Afghanistan, Sri Lanka, Brahmadesh, Siam, Cambodia, Laos, Vietnam, Annam, China, Sumatra, Java, Borneo, Malaya, China, Korea, Japan, Tibet and Khotan in Central Asia. 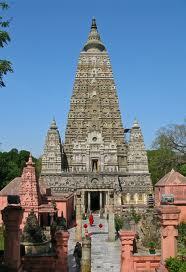 Sarnath and Bodhgaya [see pictures] are two of the most important pilgrimage centres for the Buddhists. 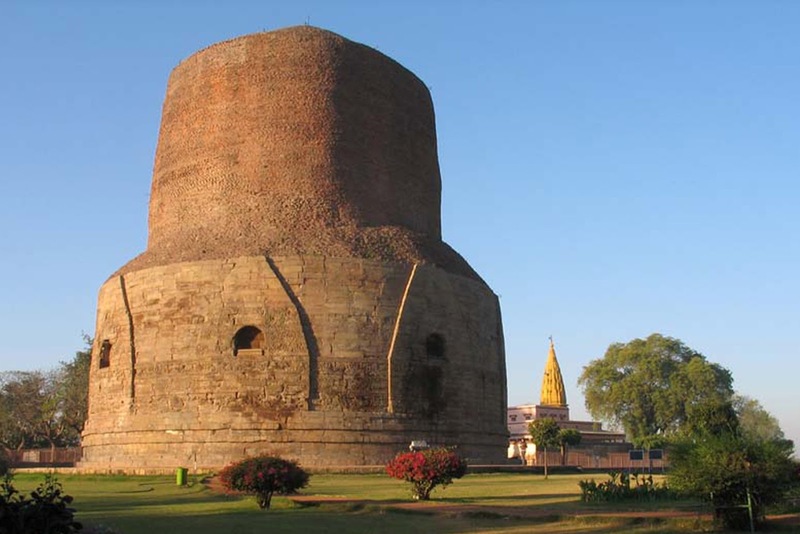 Besides Sarnath and Bodhgaya, the Buddha Purnima is also celebrated with religious fervor at Kushinagar and other parts of India and the world. Buddha's overflowing love for the downtrodden and destitute acted as one of the greatest factors for social harmony and justice to the weaker sections in the society. Once Lord Buddha had camped in the kingdom of Bindusara. The king - a disciple of Lord Buddha - honored his Guru with chariots-loads of royal presents and offerings. The other disciples also, many of them rich, made offerings to the best of their ability. At the end, an old and poor woman trekked slowly to the presence of Lord Buddha, offered a small pomegranate and collapsed at his feet, Lord Buddha ordered the bell of honor to be rung in her name for that day, to the utter surprise of the king and his subjects.